maxcovr provides tools to make it easy to solve the “maximum covering location problem”, a binary optimisation problem described by Church. Currently it uses the lp solver from the lpsolve package. maxcovr aims to provide researchers and analysts with a fast, accurate and extendible implementation of Church’s maximal covering location problem, while adhering as best as it can to tidyverse principles. In the future maxcovr will be able to talk to commercial solvers like CPLEX and Gurobi, and will have a mechanism for extensions. maxcovr was created to make it easy for a non expert to correctly solve the maximum covering location problem. This problem is beginning to be applied in problems in AED placement, but has been applied in many different areas. However, many of the implementations in papers commercial software such as AMPL, Gurobi, or CPLEX. Additionally, the code that they use in the paper to implement the optimisation is not provided and has to be requested. As a result, these analyses are more difficult to implement and more difficult to reproduce. Open source solvers, lpSolve, and glpk, that can be used on Linux, Windows, and OSX. Tidyverse principles to make it easy to use, code, and extend. As a result of this, results are easy to implement, reproduce, and extend. We already have a few surveillance towers built, which are placed on top of the listed buildings with a grade of I. We will call this dataset york_existing, and the remaining building locations york_proposed. Here, york_existing is the currently locations of facilities, and york_proposed is the potential facility locations. We are interested in placing surveillance towers so that they are within 100m of the largest number of crimes. We are going to use the crime data that we have to help us choose ideal locations to place towers. Visually, the coverage looks OK, but to get a better estimate, we can verify the coverage using the nearest() function. nearest() takes two dataframes and returns the nearest lat/long coords from the first dataframe to the second dataframe, along with the distances between them and the appropriate columns from the building dataframe. You can think of reading this as “What is the nearest (nearest_df) to (to_df)”. Note that maxcovr records the positions of locations must be named “lat” and “long” for latitude and longitude, respectively. The dataframe dat_dist contains the nearest proposed facility to each crime. 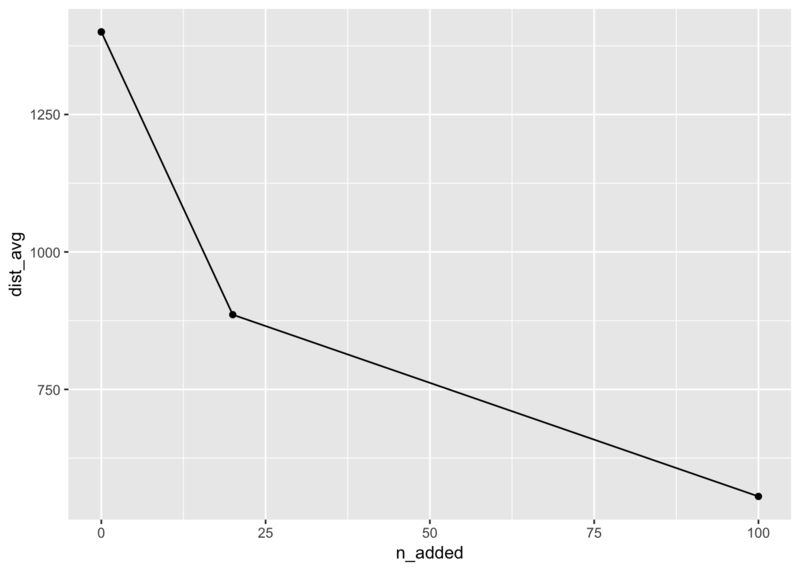 This means that we have a dataframe that contains “to_id” - the ID number (labelled from 1 to the number of rows in the to dataset), “nearest_id” describes the row numer of “nearest_df” that corresponds to the row location of that data.frame. We also have the rest of the columns of york_crime. These are returned to make it easy to do other data manipulation / exploration tasks, if you wish. To evaluate the coverage we can use summarise_coverage. Here, we need to create a column called “is_covered”, which is TRUE if the distance measure from nearest is less than some set distance, and FALSE otherwise. ## 1             100   685      1129   0.378       0.622     355. 422.
dist_avg - the standard deviation of the distance from the rows to the nearest facility or user. This tells us that out of all the crime, 37.76% of it is within 100m, 339 crimes are covered, but the mean distance to the surveillance camera is 1400m. Knowing this information, you might be interested in improving this coverage. To do so we can use the max_coverage function. distance_cutoff = the distance that we consider coverage to be within. Similar to using nearest - the data frames for existing_facility, proposed_facility, and user need to contain columns of latitude and longitude, and they must be named “lat”, and “long”, respectively. These are used to calculate the distance. Here this tells us useful information about the distance cutoff, the number of facilities added, and the number of users covered, and previousl, and the proportion of events covered. To get this information out we can use the information in each of the columns below. The information each of these is a list, which might seem strange, but it becomes very useful when you are assessing different levels of n_added. We will go into more detail for this soon. Firstly, we have the data input into n_added and distance_cutoff - the same information that we entered. ## 1       0             100   339   0.187      1475       0.813    1400. This provides us with the information that we saw previously with summarise_coverage. We can then get the information of the coverage from the model with the added additional AEDs with model_coverage. ## 1      20             100   540   0.298      1274       0.702     986. ## 2      20             100   540   0.298      1274       0.702     986. You can drill deeper, and get more information about the facilities using facility_selected, which returns facilities selected from the proposed_facility data. This returns the dataframe of users, with the distance to their nearest AED, and at the end, provides information about the type of AED that is used. We can assess what happens if we add 100 facilities. So then, if we want to add information to discover the differences between 20 and 100, we can bind these two pieces together using bind_rows. ## 3       0             100   339   0.187      1475       0.813    1400. ## 4     100             100   693   0.382      1121       0.618     560. 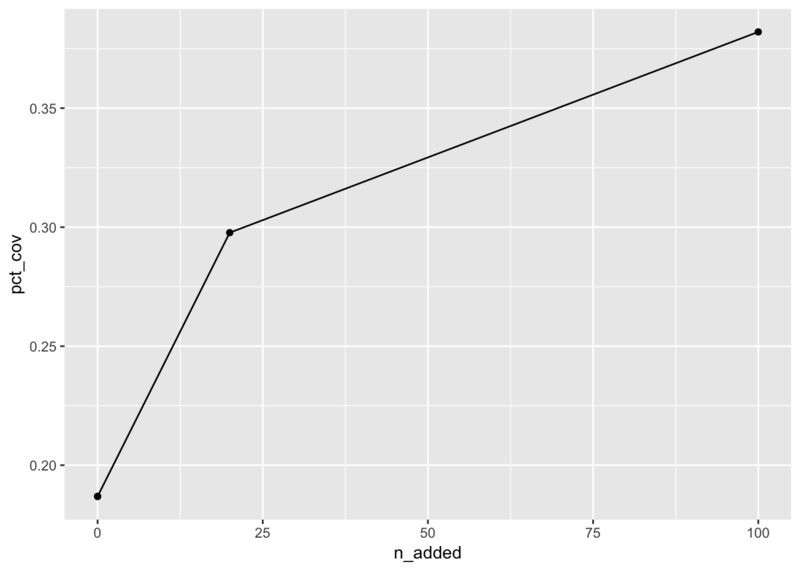 You can then produce a plot of the average distances. ## 1      986. 1188. 620. 18.0          4593. This can then be used to create a new column with purrr::map(). ## 2      560. 720. 316. 16.2          2277. You might be interested in plotting the existing users, the proposed facilities, and the coverage. You can plot the existing facilities with leaflet. You might want to then add the user information to this plot. You can add new circles based on new datasets, and then change the colour, so that they are visible. With leaflet you can also specify the radius in metres of the circles. This means that we can set the radius of the circles to be 100, and this is 100m. to make this a bit clearer we can remove the fill (fill = FALSE), and also change the map that is used with addProviderTiles("CartoDB.Positron").